The vMeasure CSM measurement and analysis software is the ideal supplement to CAN- and EtherCAT-based measurement modules of CSM. With vMeasure CSM you have a convenient tool for configuring your measurement, synchronously acquiring physical values, and storing these values in MDF format. Recording of GPS and video data is also supported. vMeasure CSM saves video data in a separate AVI file. In so doing, synchronization with the measurement signals is retained, of course. 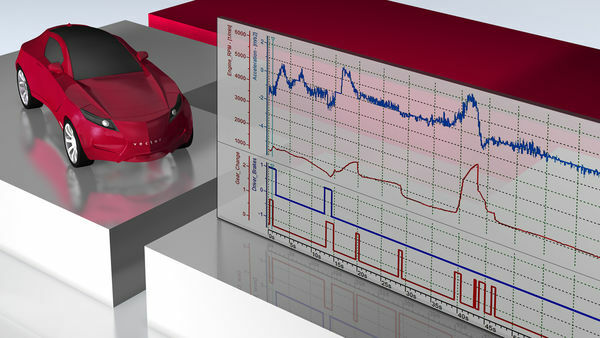 Based on the measured signal values, virtual signals are calculated during the measurement and are available to you as additional measurement data. You analyze the recorded measurement data easily in the same configuration as the measurement. The display of existing signal sequences, position data on the map, and video recordings is also synchronized. You use the printing and reporting function to document your measurement results quickly and efficiently. Numerous options for visualization of measurement values in real time: graphics window, table, bar graph, numerical display, map, video window, etc.